“Xbox SmartGlass lets your phone work with your Xbox 360 console to bring rich, interactive experiences and unique content about what you’re watching or playing, right to the device that’s already in your hand. Interact with your favorite TV shows, movies, music, sports, and games, and bring remote control to a whole new level. Xbox SmartGlass is Microsoft answer to the Wii-U’s Tablet controller. It basically adds touch screen capabilities to the Xbox as well as a second display that can hold different information that what you see on screen. 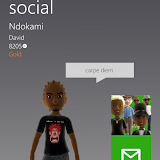 Besides being a partner to your Xbox 360 Smart glass also doubles as an Achievement app and Avatar editor. Compared to what they shown off at E3 way back when, as of the time that this review is written, functionality is very limited. To generally answer the question, yes it does. Though the app is now out of beta it still feels limited on android devices. I haven’t had too much playtime with the IOS or Windows Mobile versions to see how they differ. The PC version seems very functional but not practical unless you have a “Surface” tablet. Overall it the best achievement app you can get on android and it free. Hopefully Microsoft updates the app soon with more features like accessing your media and streaming it to Xbox.